With approximately 6000 items in these collections, I knew I wouldn’t be able to assess each item individually in the time period given, so I decided to take a representative sample from each of the collections. The Preservation Advisory Centre’s Preservation Assessment Survey recommends that 400 items should be assessed to give a statistically reliable sample. This means that the findings of this survey can be generalised to the whole collection. 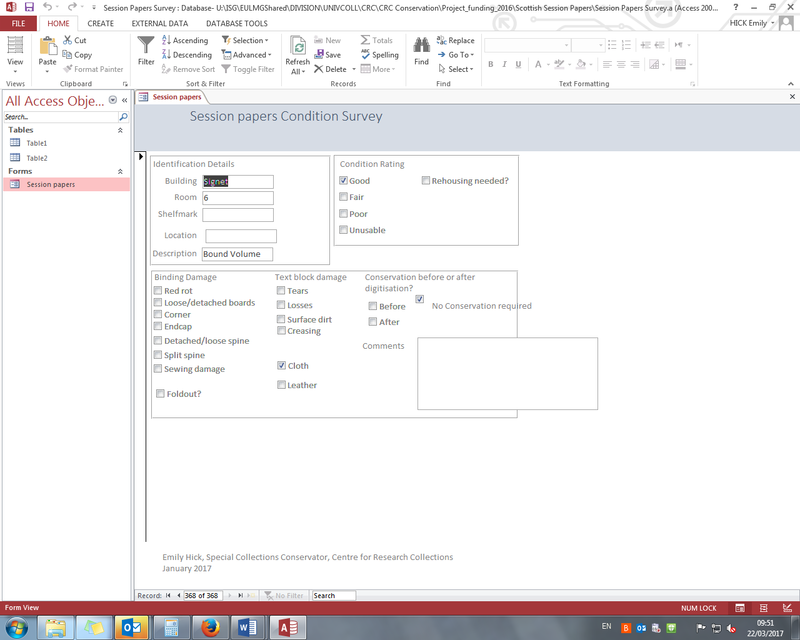 I made a tick box survey form using Microsoft Access Database to maximise the efficiency of the survey, and gave myself a maximum of 5 minutes to assess each book. There are multiple problems with the condition of the collections that will need to be addressed prior to digitisation. 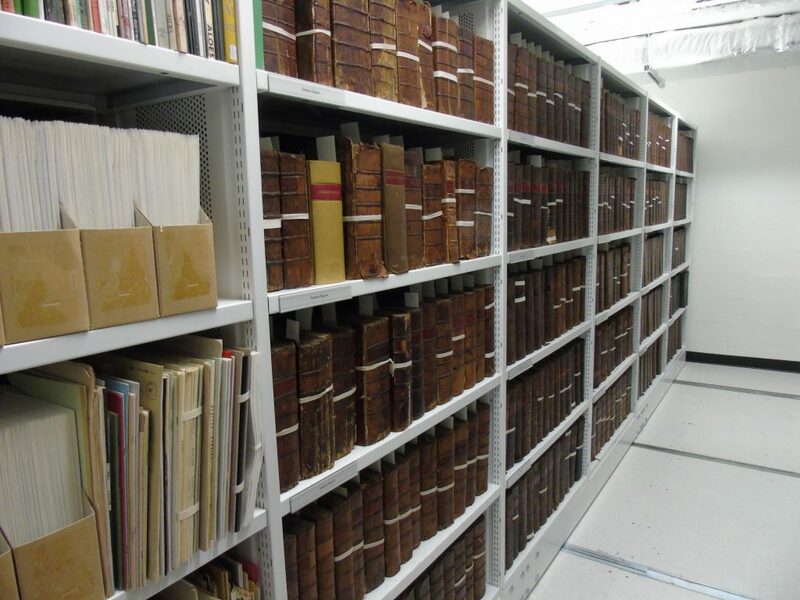 For example, many of the volumes in the collections have been bound in large formats which are difficult to handle. 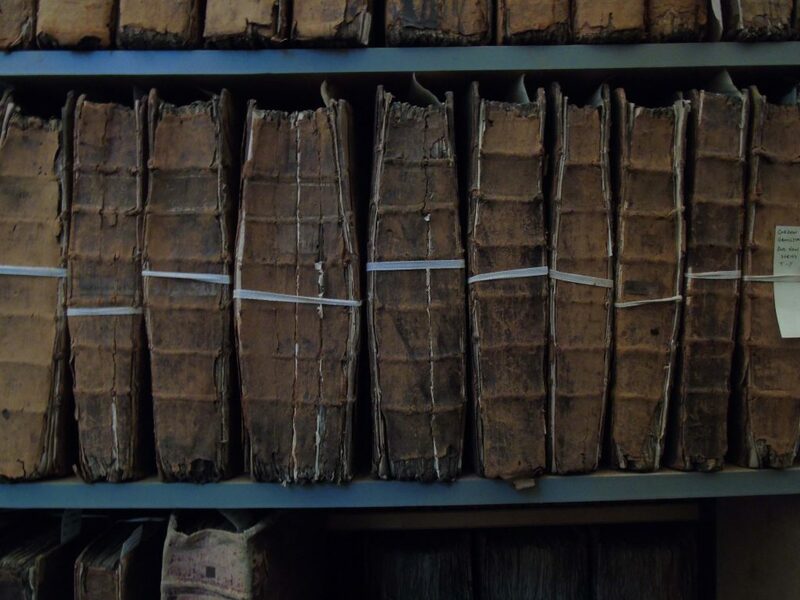 Often pages have been folded to fit into the size of the book, and then they have been tightly bound together, this makes opening and closing the foldouts difficult and has resulted in tearing in some cases. Some volumes contain pages that are different sizes. This allows the ingress of surface dirt and as a result some pages are extremely dirty. 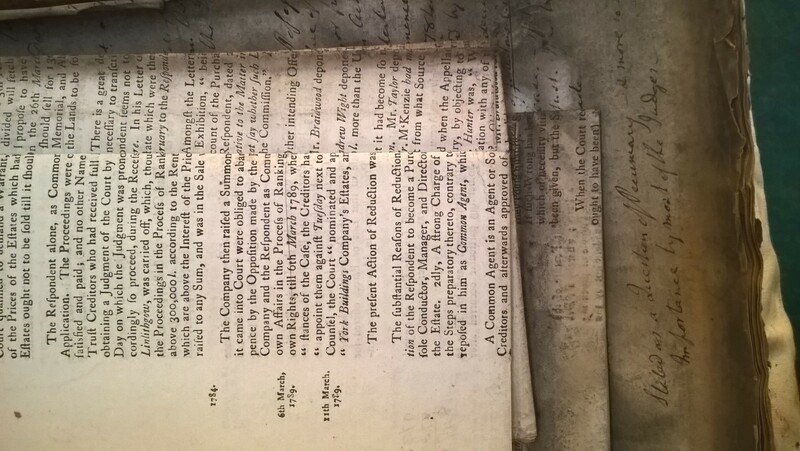 Often this obscures the text, and there is a risk it could transfer to other items during digitisation. 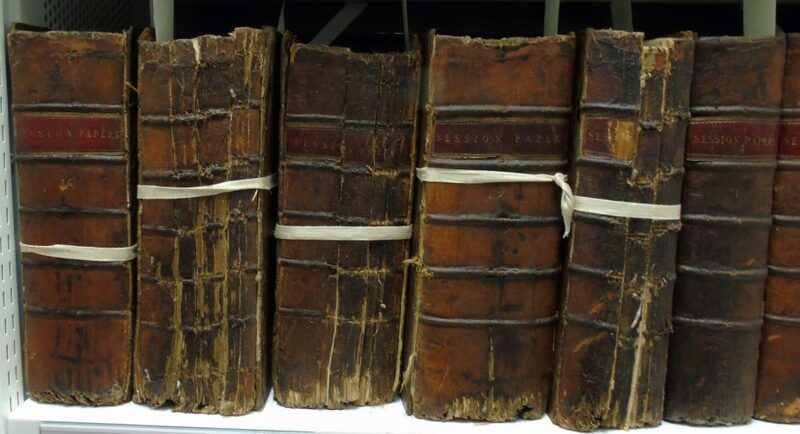 In other volumes the spines have split completely and the volume is in several sections. This has been caused by the method of binding called a tightback. In this binding method, the spine cover is glued directly over the sewing. When the binding is opened, the cover is forced to open with the spine which causes it to crack. This combined with the deterioration of leather renders the volume almost unusable. Small margins are another common problem. 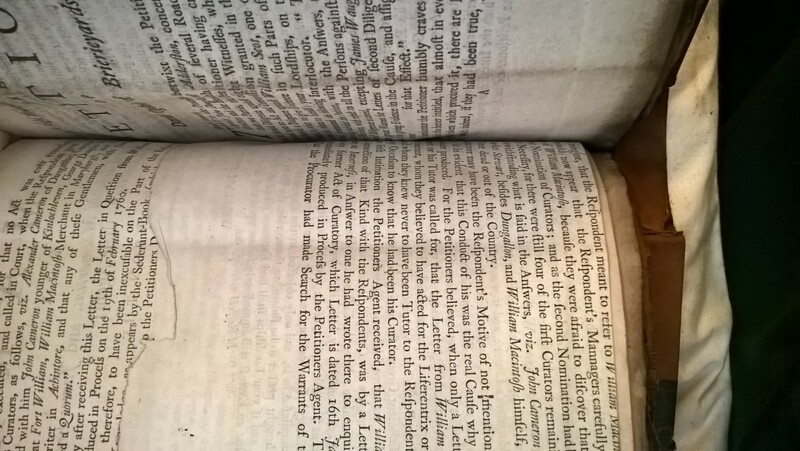 This means that the text goes into the spine and the full page cannot be captured during digitisation, potentially losing important information. If the project goes ahead, it will be time-consuming and complex, but the result of having these papers freely available to the public will be invaluable. 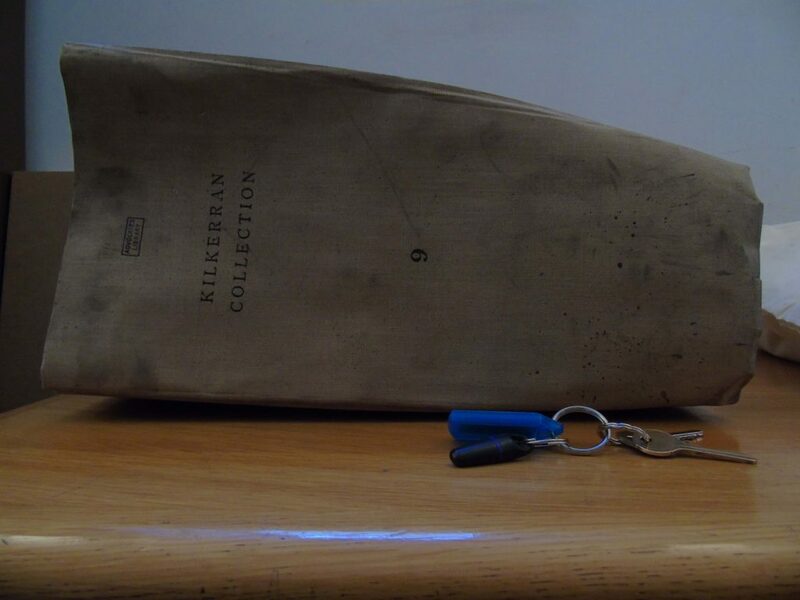 This entry was posted in Paper and tagged bound volumes, digitisation, Scottish Session Papers by conservation. Bookmark the permalink.